Baking soda is a common household item that is found in all households. It can be used in making a number of things like toothpaste, mouth freshener, or a facial scrub and body exfoliant. There’s no question on its versatility of this item. But did you know that along with all this baking soda is also great for your mattress cleaning? So, what makes baking soda so special that we can eat it but also use it to fight rust and tarnish? The answer lies in its unique chemical properties. Baking soda, or sodium bicarbonate, is basically a salt. If you ever were to taste it you’ll find that it tastes like a milder version of your table salt. Like every other salt, baking soda is a neutral compound. They are mainly formed from a positively charged ion also know as a cation and a negatively charged ion called anion. This is the reason why Sodium bicarbonate is neutral. Along with that its pH level is higher than neutral. That makes Baking Soda slightly basic (the opposite of acidic), which can be the key to understand why it is such a good cleaner. We sleep on our mattress every night. And this daily usage could lead to a bacteria build-up and germs that we would not want to percolate on your mattresses. Who would not want to sleep every night in a clean haven of soft fabric? Freshening up your mattress is important to remove the stains, dust and odour for a better experience. Also, it is important to ward off mites that may be interfering with a good night’s sleep. In this blog, we have got just the tips you need on how to clean your mattress organically – here in with baking soda. 1. The first to remove all the bedding. 2. 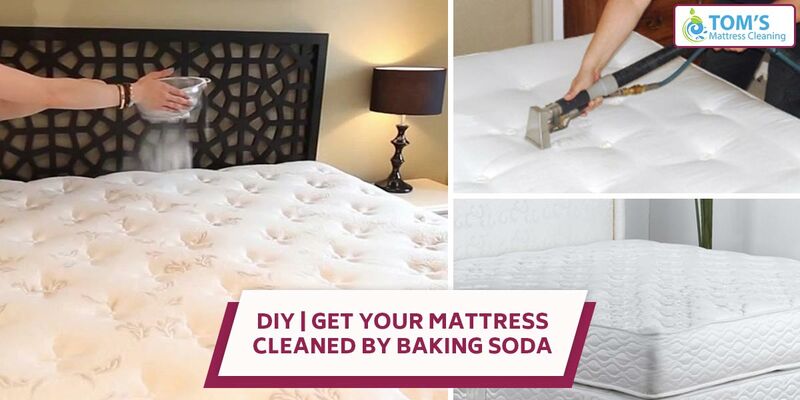 Pour baking soda into a sieve and sprinkle it on the entire mattress. The baking soda will eliminate odours by drawing out dirt and moisture. 3. Let baking soda sit on the mattress for an hour to an hour and a half. 4. Now, remake the bed with the neat and clean mattress, sheets and bed skirt. 5. Leave the baking soda underneath the clean new sheets. 6. Now you have to clean this sheets again. 7. When it’s time to wash them again, strip the bed sheet and vacuum up, along with all of the dust and dirt that has accumulated in the meantime. 8. Enjoy your clean bedsheets. If you want to get your mattress cleaned without any hassle. Hire Tom’s Mattress Cleaning to get same-day, on-site services. Call us on 1300 068 194. We have been the answer to queries like “Mattress Repair Companies Near Me” We help with mattress burn repairs and pet damage mattress repair across Melbourne and its suburbs.